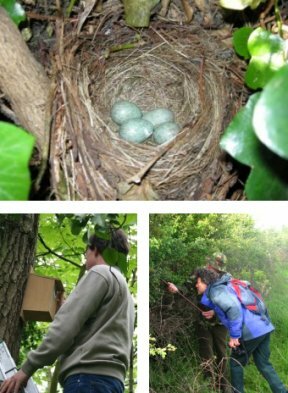 The Nest Record Scheme (NRS) gathers vital information on the breeding success of Britain's birds by asking volunteers to find and follow the progress of individual birds' nests. Anyone can be a nest recorder. Some people watch a single nest box in their back garden while others find and monitor nests of a whole range of species. Registering to take part is easy and there are lots of resources to help you get started—click the link below to find out more. To monitor some specially protected species, it's necessary to obtain a Schedule 1 permit in addition to registering as a nest recorder. As with all BTO surveys, the welfare of the birds comes first, and therefore all nest recorders follow the NRS Code of Conduct, a protocol designed to ensure that monitoring a nest does not influence its outcome. The data collected for NRS are used to produce trends in breeding performance, which help us to identify species that may be declining because of problems at the nesting stage. These trends are are updated every year and published in the BirdTrends report. NRS data also allow us to measure the impacts of pressures such as climate change on bird productivity. Details of the number of nest records submitted by year and area are available on the Online Ringing & Nest Recording Report along with information about the timing of breeding and moult. Please see the results page for more information. Widely recognised for his work on the study and conservation of owls and raptors, biologist and professional ecologist Colin Shawyer has collaborated with the BTO on projects such as Project Barn Owl (1995-1997) and the Barn Owl Monitoring Programme (2000-2009). As founder and co-ordinator of the Barn Owl Conservation Network (BOCN), Colin is in contact with Barn Owl ringers and nest recorders across the country and oversees the annual monitoring of over 3,000 nest boxes. The BTO would like to thank the network of volunteers who take part in the Nest Record Scheme. Without their hard work and enthusiasm the Trust would not be able to monitor the health of the UK’s breeding birds each year.